Numerous studies have shown markedness effects of German OVS word order, that is: decrease in acceptability and higher reading times. Some of these studies have shown these effects can be ameliorated by the presentation of context. 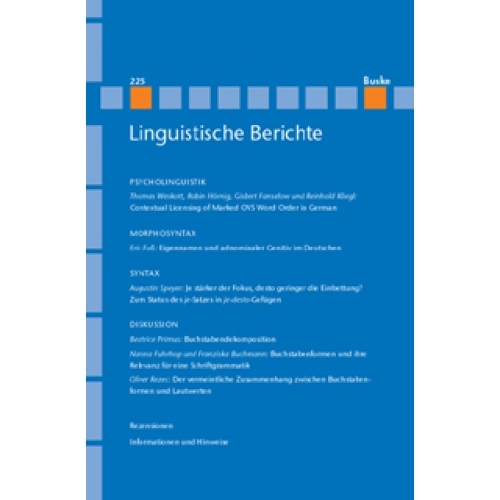 These studies found that in certain contexts the acceptability and processing disadvantage of German marked word orders can be leveled out. 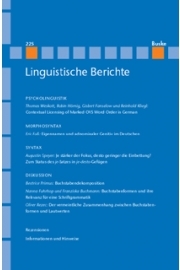 We report on acceptability ratings and a self-paced reading study which addressed the question whether there are contexts in which German marked OVS word order is not only judged as being equally acceptable and as easy to process as its unmarked SVO counterpart, but where OVS structures are strongly licensed in the sense that they are actually judged as more acceptable and are easier to process than the unmarked SVO order. Our results show that whole-part contexts are strongly licensing in this sense, and that, an adversative relation between the marked word order sentence and the context does not play an indispensable role in the contextual licensing effect.